The Society has never suffered a greater loss than that occasioned by the sudden and unexpected death of one of its most devoted members - Mr. J. J. Neale. He shares with a few other members of the Society the distinction of having served twice as president. He entered the Society about 1885, and was a member of its Committee from 1891 to the year of his death. Born in County Antrim in 1854, of English parents, he came into the world richly endowed by nature with unusual capacities, but under circumstances which made it necessary that he should develop them without much external help - his school life terminated at the early age of twelve. In his early manhood he worked for his elder brother, who carried on a business as a wholesale potato merchant at Bristol, and by self-education, combined with facilities afforded by the University College of Bristol, became so good a linguist that he was able to carry on in French and German the large business which his firm carried on in France and Germany. At a late period of his life he devoted himself to the acquisition of a knowledge of the Spanish language. Of extraordinary strength and physical vigour, he distinguished himself as an athlete in several directions. Against his wish he was on one occasion matched in a weight-lifting competition against a professional, and won, thanks to his special training in the Bristol Gymnasium. He played Rugby football with great success, and won many prizes as a cyclist. His strength of character was equally great - he never admitted himself to be beaten - if temporarily defeated, he gathered strength for a further effort, and never to my knowledge suffered ultimate defeat in any one of his ventures. Of untiring energy, he for many years did a day's work before the normal hour for breakfast; and yet his evenings were always available for service in any effort of which he really approved irrespective of its popularity. He was naturally keen of eye, little that was of interest to him escaped his observation. His business as a trawler owner and fish salesman at Cardiff brought him into daily contact with one department of natural history. Concerning this he was remarkably reticent, although his knowledge was so profound that on more than one occasion, in conflict with Government experts on questions of fact, it was not he who was proved to be wrong. His interest extended, however, to many branches of natural history, but more especially to birds, insects, shells, and plants. 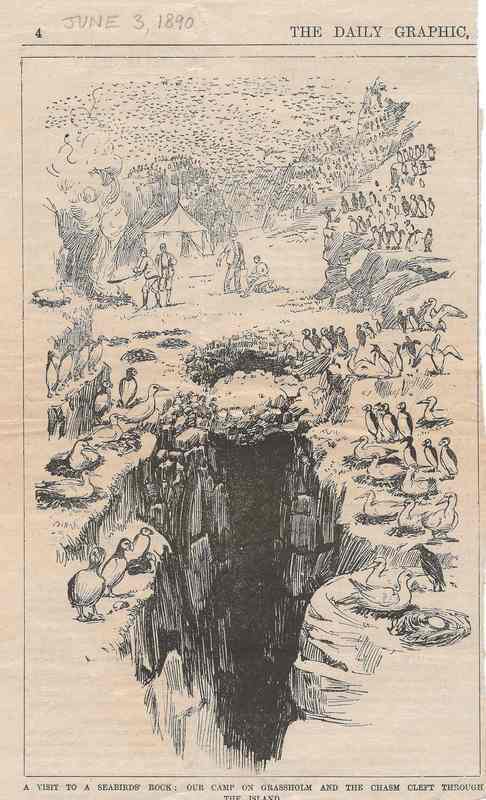 His interest in birds led him to make several expeditions to the birds island off the coast of Pembrokeshire, and at one time to take a lease for ten years of the Island of Skomer where he made a close study of the habits of the various interesting birds which nest there. Some of this work was fortunately communicated to the Society in the form of popular and much appreciated lectures. Although not a botanist in the strict sense of the term, his knowledge of the Flora of Glamorganshire was very wide, it was almost impossible for him to pass by a rare or interesting plant. Nothing pleased him more than a scramble over the escarpments and cliffs of Glamorgan, or a day amongst the numerous sand dunes of this county. It was natural that the culture of orchids should attract him, and before his death his collection probably included more than 500 species and thousands of individuals. It is not too much to say that he knew them every one, not only in flower, but by the foliage or other vegetative characters, and even in the dried-up condition in which many of them reached this country. As is so frequently the case with the born naturalist, he was intensely interested in archaeology, local history, travel and sport, and his library, valuable and extensive, and still intact, reflects faithfully his tastes in this direction. 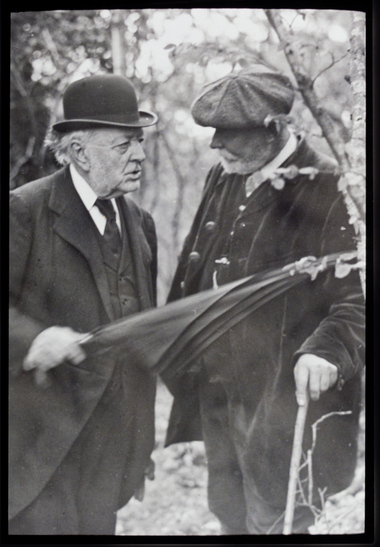 Mr. Neale came to Cardiff in 1884, to set up in business with a partner - Mr. West - as fish salesmen. This business was for years conducted with great vigour and success in very restricted premises at West Canal Wharf, but was in 1897 removed to Hope Street, where it is now being carried on by his seven sons under the original name of Neale & West, Ltd., although Mr. West has recently withdrawn from partnership. The demands of a fleet of trawlers at one time 17 to 20 for constant supplies of ice, made it necessary that cold storage premises and an ice producing plant should be established in Cardiff, and it was largely due to the foresight of Mr. Neale that the Cardiff Ice Company was established a company which since its formation has had a very successful career and over the development of which Mr. Neale, as joint manager with Mr. West, lavished the utmost care. In 1917, realising the desirability of throwing more responsibility upon his sons, and desirous of more leisure for pursuing his many hobbies, Mr. Neale bought Oxton House, near Kenton, Devon, and removed there two and a half years before his death. The estate covers about 700 acres, but its chief charm for its new proprietor was the extraordinary beauty of the surroundings. The large woods, which afford shelter for fallow deer and more than one family of buzzards, and numerous specimen trees the finished product of a century's growth-formed perhaps for him the chief attractions. Here both Mr. and Mrs. Neale found the rest and recreation they sought under almost idyllic conditions, and all their friends will regret that he was not allowed to spend a happy old age in such a congenial environment. But his work was done manfully had he striven, building up a personal character which his friends will gratefully and profitably remember: and a business which has added to the strength and prosperity of Cardiff. He was suddenly struck down by peritonitis, underwent an operation on Christmas Day, and passed away on December 29th, 1919, and was buried in Kenton Churchyard on December 31st, 1919. 1888. Trawl fishes of the Bristol Channel. 1889. Surface fishes of the Bristol Channel. 1892. Specimens recently obtained by local trawlers. 1894. Holiday on St. George's Island, Looe. 1896. Remarks on a Specimen of the Spinous Shark (Echinorhyncus spinosus). 1897. Notes on a visit to Skomer. 1898. The Bird Islands of Pembrokeshire. 1900. The Raven at home and in captivity. 1900. Remarks on a recent trip to Grassholm and Skomer. 1900. Habitats of some rare Alpine Plants in the Snowdon district. 1901. Notes on Natural History of least known parts of the Vale of Neath. 1904. Recent visits to unfrequented parts of Ireland. 1906. Holidays among British Birds. 1910. Recent Notes on the Birds of Pembrokeshire. 1913. From Cardiff to Kordofan. Also Presidential Addresses in 1900 and 1918. In 1890 he visited Grassholm with three other members of the Cardiff Naturalists' Society, T H Thomas, Thomas William Proger and Henry West, to see the gannets. Here they witnessed the destruction of the sea birds by a naval company from HMS Sir Richard Fletcher. 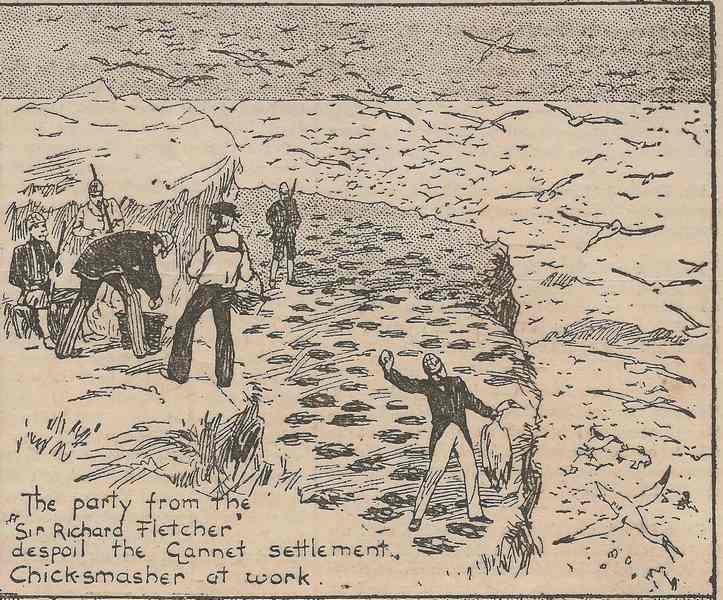 They were appalled by the destruction and Thomas sketched the scenes which later appeared in the Daily Graphic and Animal World. 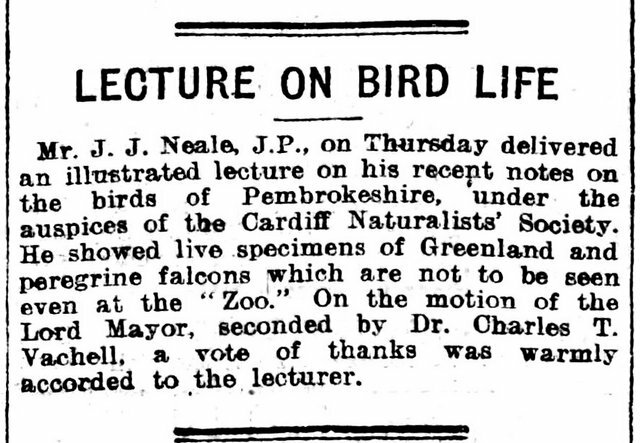 As was noted above, in order to aid the protection of the birds on the Welsh off-shore islands as well as to aid research, J.J. Neale took over the lease of Grassholm and Skomer. Joshua John Neale and his cycling friend, Henry West, used the West Dock as a base for their deep sea fishing fleet. The two men began their association as fish merchants in Custom House Street but in 1888 they decided it would be more profitable to supply the retail trade. Beginning with a single trawler, the firm of Neale and West had a fleet of 19 ships by 1906. As a sideline, Neale and West trained Japanese fishermen, which may explain why such strange names as Fuji and Kurokiwere given to their trawlers.